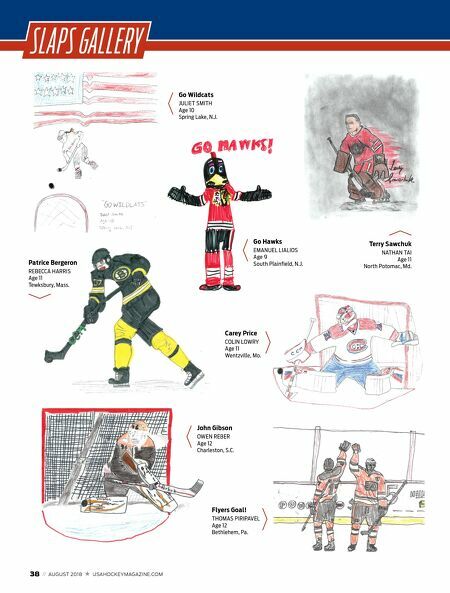 38 // AUGUST 2018 USAHOCKEYMAGAZINE.COM S L A PS GA L L E RY Patrice Bergeron REBECCA HARRIS Age 11 Tewksbury, Mass. 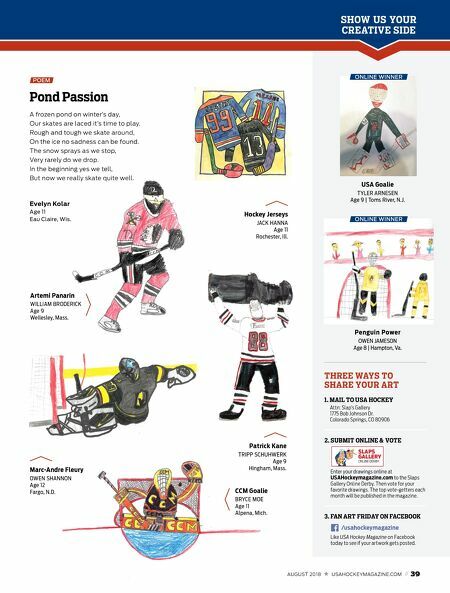 Go Hawks EMANUEL LIALIOS Age 9 South Plainfield, N.J. John Gibson OWEN REBER Age 12 Charleston, S.C. Terry Sawchuk NATHAN TAI Age 11 North Potomac, Md. Go Wildcats JULIET SMITH Age 10 Spring Lake, N.J. Flyers Goal! THOMAS PIRIPAVEL Age 12 Bethlehem, Pa. Carey Price COLIN LOWRY Age 11 Wentzville, Mo.